ECU is committed to the development of all staff in support of their personal professional aspirations, aligned to the strategic priorities and business needs of the University. In support of this commitment, ECU has established a Professional Development Fund to provide further professional development opportunities to Professional Staff and Academic Career Development Fellows. An individual can access this fund once, to a maximum of $5000 per individual, every two years (for professional staff). If FBT applies to the funding, it will form part of the allocated amount so the applicant would only be eligible to spend the net-of-FBT amount on their professional development opportunity. Please refer to the FBT examples in Section 5 of the Principles and Guidelines document. The purpose of the fund is to allow further development of Professional Staff and Academic Career Development Fellows that will be of mutual benefit to ECU and the staff member. Human Resources Services Centre (HRSC) administers this fund and provides funding details to the Joint Staff Consulting Committee (JSCC) annually. It is important to note that this fund does not replace normal staff development offered by ECU to staff. Normal staff development is the joint responsibility of the individual and the supervisor, within a directorate budget. Please refer to the eligibility guide within Section 3 and 4 of the Principles and Guidelines document. It is recommended that all staff discuss ways of maximising the benefits of the fund with their manager/supervisor in regular MPS discussions and start recording it as such in their individual development planning. The online MPS is available from the “My HR" menu in the staff kiosk. The MPS discussion is ideal for staff to explore capability enhancement opportunities to perform their role and preparing for future career moves, to their own and ECU’s benefit. Applications are now invited for PD events to be completed before November of the current year. There is no specific closing date for these submissions. 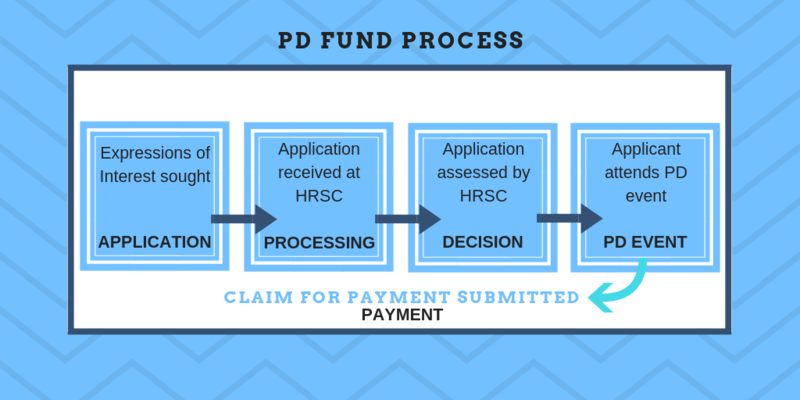 All reimbursement claims for funds awarded, for a specific year’s events, must be submitted before the end of the first week in December in the year you applied for the fund. Approval of applications will be subject to candidates meeting the guidelines and availability of funds. Note that the reimbursements of approved funds are available in accordance with completion dates provided by individuals.